CFL and LED bulbs don't produce the same color or full spectrum of light as incandescent bulbs. CFLs and LED bulbs last longer (often much longer), but their expected life can vary quite a bit. 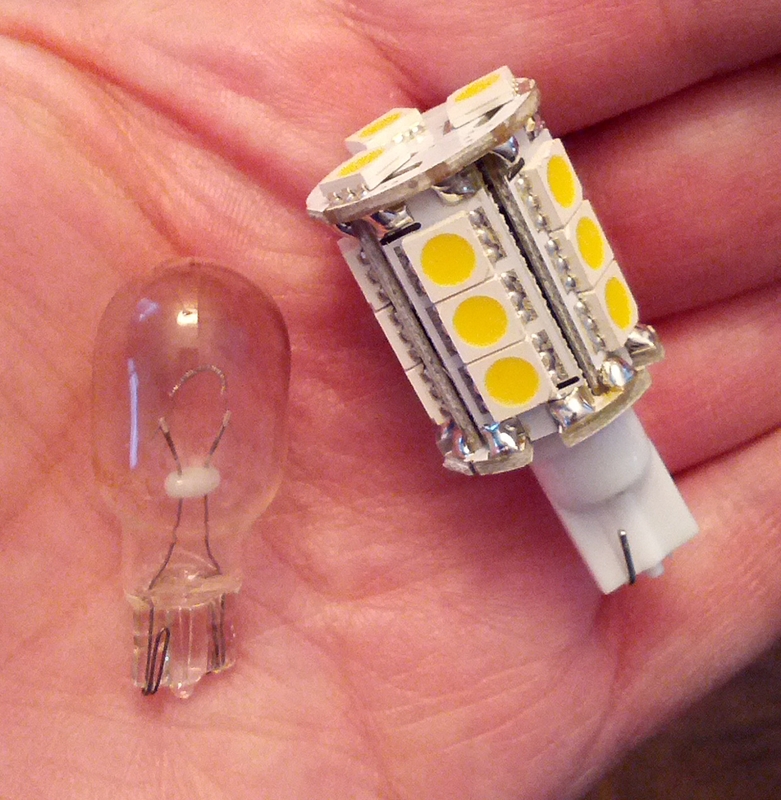 LED bulbs currently don't put out as much light as incandescent bulbs can (e.g. beyond 75 Watt equivalent), so might not be a good choice when you need a lot of light. LED lighting is very directional with bulbs containing many individual LEDs. This means you may have to choose a particular packaging that is appropriate for your application. As my porch light had just burnt out and I was out of replacements, I thought I'd go green and switch to LED outdoor lighting. Given the higher cost of CFL and LED lights, it made sense to me to start with my lights that are on the most. 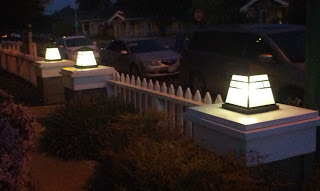 My outdoor lights are on 8-12 hours per day (an obvious first choice even if they are fairly low wattage). My goal was to fully recover the cost of the new lights in 1 year or less (I came close). Given that the bulbs should last many years, I'll be saving a significant amount of money in the long run. Plus, I'm immediately saving electricity. It is nice when you can be green while saving green. This turned into two different mini-projects. I first replaced my porch light and then later converted all of my outdoor lighting. I also learned a bit in the process. I'll share how I did it and I have lots of pictures for you to enjoy. Lesson one: LED bulbs (and also CFLs) don't like dimmers. 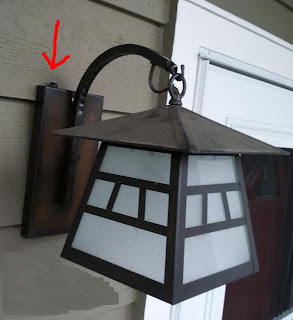 That is one of the first things that I read about when looking for a light for my porch. I did have a day / night sensor on my porch light, but I assumed it would be okay (I was wrong!). Well, after about a week the light bulb burnt out - not a good sign. Good thing I had a spare! After a second bulb burnt out, I wasn't feeling so smart. I had a feeling my day / night sensor might be at fault. I read a bit about day / night sensors and learned that there are different types. I had one that is wired in-line with the light. With only two wires, it doesn't ever completely shut off the power for the light. In fact, I noticed that the LED bulb would still glow slightly during the day time (my first clue). Even when fully on, the bulb would buzz audibly (my second clue). I suppose incandescent bulbs can take the abuse caused by the sensor, but an LED bulb apparently can't. What I needed was a day / night sensor that fully switched off the light (e.g. with a mechanical relay). 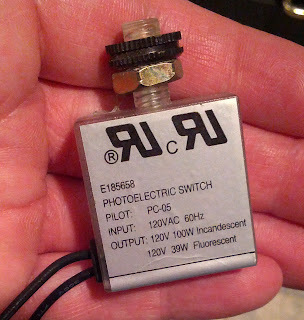 I found these sensors by searching for "fluorescent compatible dusk/dawn sensor" (they weren't otherwise easy to find). 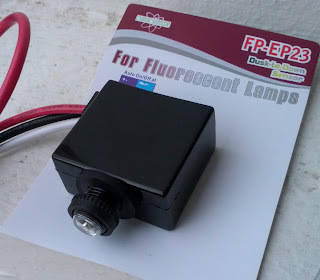 This sensor should work for any type of bulb (both CFL and LED alike). Since it was cheap (and easy) enough, I simply replaced by old sensor. Of course, I could have also simply disabled the old sensor. LED bulbs use so little electricity, this would only be a minor waste and cost. With the new sensor I'll save money mostly by making the bulbs (hopefully) last longer. Besides, after destroying two bulbs, it was now a matter of pride that I make it work! 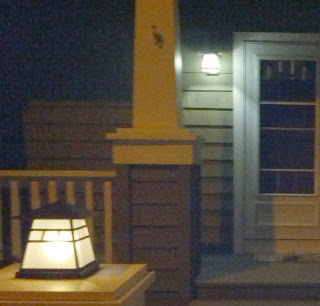 Here is my new LED porch light on with an (incandescent) outdoor column light in the foreground for comparison. Note that the color of the porch light is a bit whiter, but still acceptable (in my opinion). 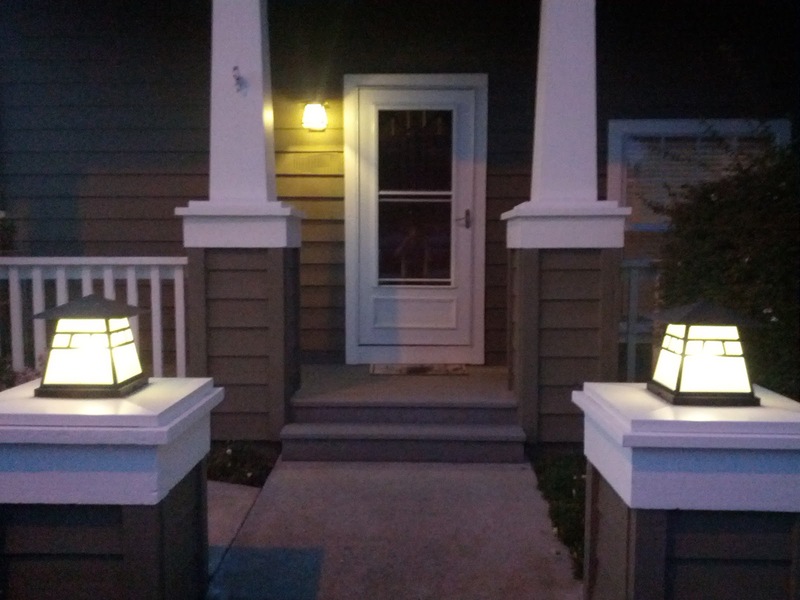 With the porch light done, I thought I'd tackle the (hopefully easier) outdoor lighting for my housing complex. We have a 12V AC (low voltage) system with 18 lights in total. 10 of the lights are 25 Watt column lights and the remaining 8 are 16 Watt stake lights. This is a total of 378 Watts! Even with our timer / light sensor, they are on about 8 hours a day and consume about 3 Kilowatt hours per day (very wasteful in hindsight!). The above link is a reference. I actually found the bulbs cheaper elsewhere at about $5 per bulb here. After installing these bulbs the actual measured total power (using my handy Kill-O-Watt meter) dropped from 370 to under 40 Watts (a huge difference)! I figure this is going to save $75 per year. And, as a bonus, they are in fact brighter than the bulbs that they replaced! As far as color is concerned, they are definitely "whiter", but since I got the "warm white" version, they aren't bluish - white like many outdoor LED lights. They also now perfectly match my porch light. 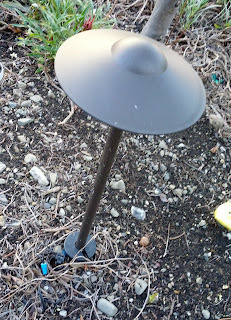 Note: For the outdoor lights, I had two types of fixtures to deal with (column lights and stake lights). Both types of lights are low voltage (12 V AC). Note that our column lights are a bit unusual in that they use a regular (medium base) 120 Volt light fixture. 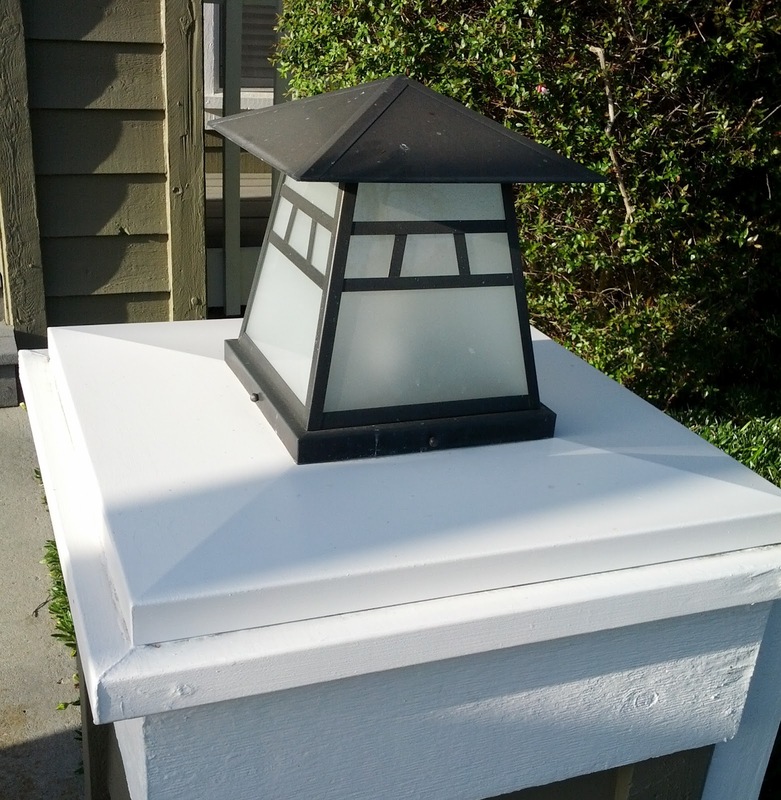 This was a pain because I had to find low voltage bulbs that screwed into a medium base (shown above). While it is possible to also find low voltage LED bulbs with a medium base, they are more expensive and you don't have as many choices (like wattage and light color). I thought it would be better if I could find an adapter which would enable me to use the same bulbs as I do for our stake lights. 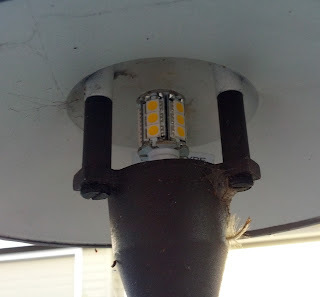 In case anyone is interested, I bought the adapters (shown installed above with the LED bulb) from Harrington Lights (product id R3-MED-T5-WEDGE). Note that the replacement LED bulbs are a bit taller than the incandescent bulbs that they replaced. Fortunately, they still fit in the stake lights (but it was a much tighter fit as you can see below). Sounds remarkably similar to my ongoing project to repair/replace garden lights with LED. I use G4 bulbs which look much the same as the wedge style you show, but the pins protrude which makes them really easy to wire into just about any fitting. 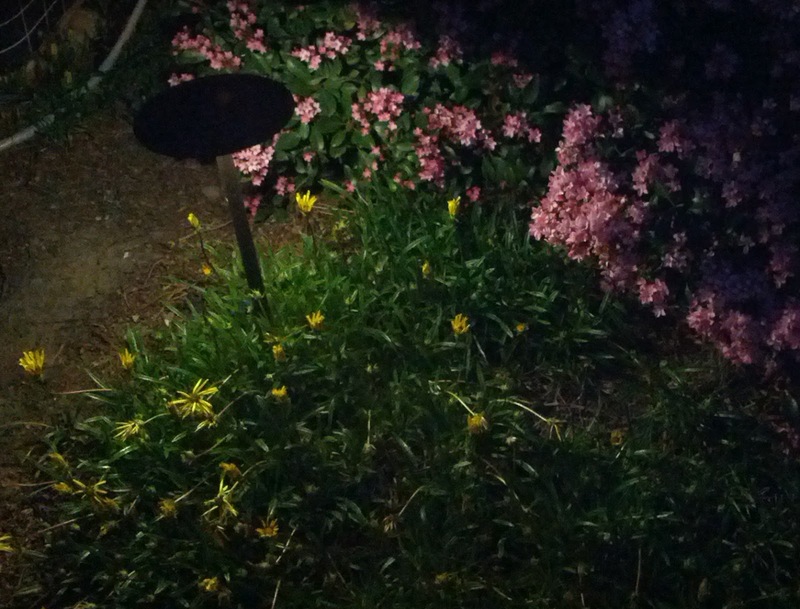 I started doing it for reliability reasons, but when you can replace 20W lamps with 2W ones its starts to get you thinking about the financial savings too (I really like my garden lighting so it's on quite a lot). That sensor works really great. I also have that on our porch and garden lamps. Thanks for showing us this modifications. Just like any other emergency vehicle lights, led outdoor lighting is also very helpful at home. It can be used to save energy that will surely lower your electric consumption, thus lowering your electric bill as well. In fact, I have the same kind of alternative lighting as well. 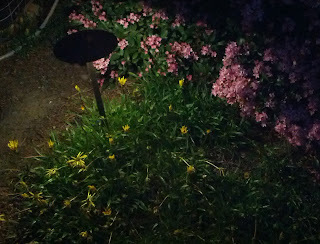 Your post gives new meaning to led light bulb decorations, I'll try your design schemes in my home's garden area. are your wedge LED lights weather proof? seems like the circuits on your garden stakes are exposed to the elements (in NJ where I leave I might get snow covering them). Was this a consideration? Yes, the wedge stake lights are exposed to the weather. Unless they are knocked over, rain should not get to the LEDs. I did check with the LED retailer and they claimed they were okay for outdoor use. So far, no failures or issues. We don't get snow here, so that could be a problem for these lights. CFL PROBLEM! IF you turn a CFL bulb on and off very often they fail quickly. Given the higher cost and environmental impact this is a bad choice. IF it is for an all night light then it is a good choice. LED light however are much cheaper and pay for themselves much quicker than CFLs. Look at your power bill and see the highest tier you are paying and then add taxes etc. This is the rate to calculate your savings from. It may be closer to 30 cent/kwh or more. 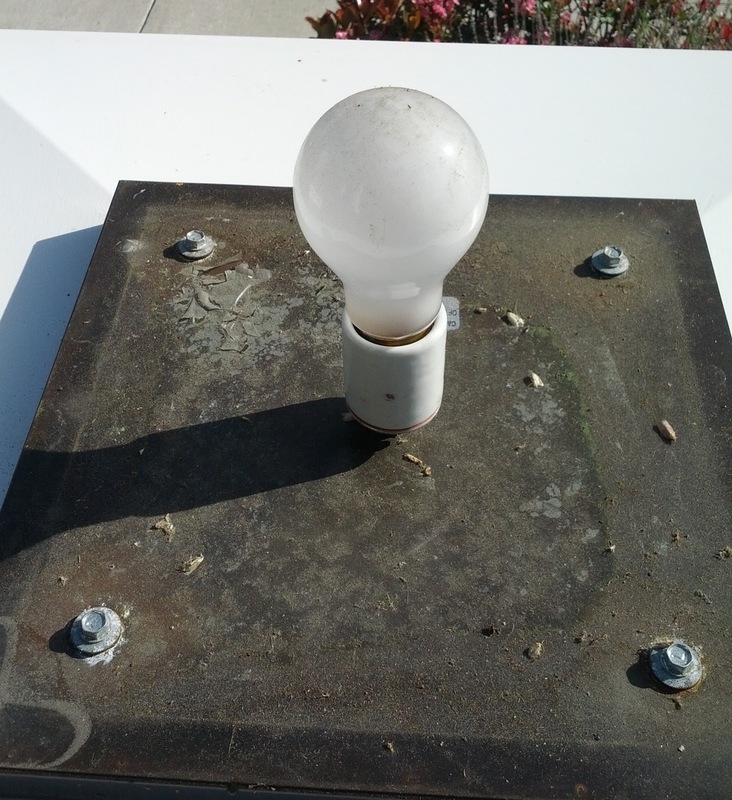 Figure the hourly savings and hours and then figure you will not be replacing this light for probably 50,000 hours. LEDs pay for themselves very quickly over a halogen and then keep on saving. Once you do the math you won't believe you haven't done it sooner! 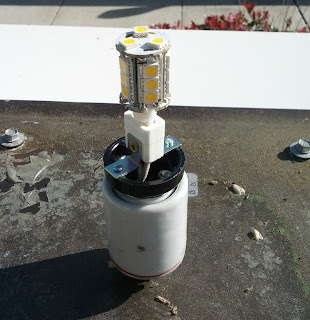 I've considered replacing my outdoor lighting with LED bulbs, however, I believe it could damage the transformer to place a significantly lower load on it. Did you replace your 12-volt transformer when you went LED? If not, did you have any problems? No problems, although my transformer has a low and high output setting. I switched to the low output since the reduced power draw was well under that rating (and, I assume, more efficient). I'd recommend checking to see if your transformer has a minimum output (or select-able output levels). If you were still below the minimum, you could obviously replace the transformer or consider only replacing some of the outdoor lights with LED to keep above the limit. What a great way to cut your electricity bill and at the same time making sure that the lights are always efficient, I be sure to try this out as well. Thanks!